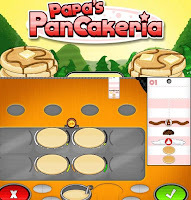 Papa's Pancakeria is a new point and click food serving simulation game from flipline studios. Papa Louie is back and he is still not working but to hire you to run his pancakeria bussiness. Help Prudence or Cooper run this little pancake store. Your duty is to cook and stack pancakes, french toast and waffles in this another great time management game. Arranging toppings, stacking pancakes and pouring syrup is not an easy task to do but it is fun to do. You don't only earn cash from satisfied customers, you also get tickets to seven mini game show by Foodini where you can win prizes that you can use to improve your overall score. Analysis: despite the fact that this game offers challenge that requires you to push the limits of your multitasking prowess, the gameplay gets repetitive but before you know it, the game already took many hours of your life and you don't regret it even a bit. Meanwhile, I collect Papa's Pancakeria walkthrough so you don't have to.